When Chronos entered the Waverider in 1958, he didn’t just attack the team and force them to take off and leave behind Ray, Sara and Kendra; he messed with Gideon on the bridge. Rip sends Stein and Jax to get on the Jumpship, but after they hear Hunter and Snart in combat with Chronos, they decide to merge as Firestorm and fight him. He’s gone though, and he took Snart hostage. Hunter makes it to his feet and realizes what’s happened, so he takes a drastic measure: reset Gideon. Back in 1958, Sara, Kendra, and Ray wait around before stealing a car and then settling in in Hub City. Vandal Savage is still looking for them after all. Weeks pass by with no word, and Ray works on a Time Beacon Radio, but as good plans go: it fails. Sara says what they’re all thinking, the team is dead and they need to move on. So she packs her bag and leaves. Two years later, Ray is teaching at a college and still living with Kendra. They’ve settled into 1960s life well and, as he prepares to propose, Ray tells her he never thought he could do this with someone else. Ray holds on to the engagement ring when a ping comes through on his time beacon, and Rip Hunter lands in front of them just minutes after last seeing them. As they get back on the ship, Ray laments that he had made peace with being in the past while Kendra is ready to get back in her modern digs. Rip asks where Sara is off to, but in actuallity they have no idea. Rip also reveals that Chronos took Snart hostage in his seige, which triggers suspicion in Kendra’s mind. On Chronos’ ship, Snart wakes up to find he’s a hostage. Ray reveals he needs to go back to their apartment to get his ATOM suit and when he asks Kendra if she wants him to pick up any of her things she politely declines, a decision that baffles him. Meanwhile in Nanda Parbat, Ra’s al Ghul and a young Talia (making her debut in the CW-DC-verse!) 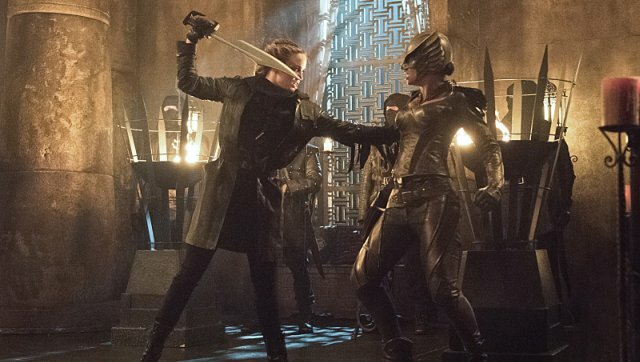 watch as Sara spars with other members of the League. Back on Chronos’ ship, Snart asks why he took him hostage and what makes him so special. You really shouldn’t ask questions you don’t want to know the answer to, because Chronos removes his mask to reveal why: Chronos is Mick Rory. We flashback to when Snart took him to the woods and see, naturally, he didn’t kill him, just left him for Dead. Rory fills in the gaps, saying the Time Masters found him at the end of his rope, but he spent lifetimes training with them to the point where they barely had to ask if he wanted this mission. On the Waverider, Ray tries to talk to Kendra who he says is acting like the last two years never happened. Kendra counters that she was just excited to be herself again while Ray thinks returning to the Waverider is like them moving backwards. This gets the gears turning and the team realizes where Sara has gone: The League of Assassins. Snart yells at Rory to go ahead and kill him, but that’s not the plan. He’s going to take a trip to Central City and kill Snart’s sister Lisa in front of him, and since they’re on a time ship they can do it forever, and ever, and ever. Before that though, they get word the Waverider is headed to Nanda Parbat in the 1960s, and chart a course after their fellow Legends. Mick has found a new love over fire, vengeance. The team sneaks to a side entrance in Nanda Parbat and Rip finds Sara asleep. After foolishly waking her up, she takes him hostage and yells for the League to protect Ra’s from the intruders. Tired of waiting, the other Legends enter to find Rip and are quickly captured. Sara separates and shackles the team, informing them that they’ll be executed. Rip realizes that Sara is experiencing Time Drift. After spending too much time in an alien timeline, she’s lost her former self. Kendra cops to feeling this too, a surprise to Ray, and she points out that she hasn’t sprouted her wings in almost two years. The two try and have a chat with everyone staring and Kendra says at least if they die now they’ll have a purpose, the fourth piece of dialogue that spurs a thought in another character, this time Rip. He knows all the League’s old traditions, so he knows how to get them out of here. On Chronos’ ship, Snart asks Rory to let him out, but as you can imagine, he doesn’t. As Chronos leaves, Snart works his way down the pipe that binds him until he finds a spare freeze gun (how’d that get there?) and jimmies it to aim at his hand, freezing his right fist solid allowing him to smash it on the floor and escape. Back in Nanda Parbat, Rip demands a trial by combat, which Ra’s allows and selects Sara as his champion. Ray tries to be noble and volunteer, but Rip chooses Kendra, knowinig since Sara helped her find her inner-warrior, maybe she can help Sara find her inner-person. The two start to brawl and Kendra finally lets her Hawk side shine, but it’s not enough. Sara stands over her, and Kendra begins to appeal to her… just as the explosions ring out and Chronos arrives. Chronos begins to take down the League members like they’re nothing, and Rip asks Ra’s to free them so they can help, especially since he’ll never beat him alone. Ra’s complies, especially since they brought him there and the Legends have their first team-based fight that is actually visually interesting and not a complete mess. Each member takes a swing until Chronos is on his knees, but before they can deliver the killing blow, the one-handed Snart enters and tells them not to. Firestorm unmasks Chronos and they all learn the truth. As they prepare to leave, Ra’s has it all figured out, how they’re from the future and Sara will one day be a member of the League again. Knowing this, he lets her free, but then Sara breaks one of the biggest rules of time travel and not only tells Ra’s about Nyssa, but to make sure that she’s on Lian Yu to rescue her in 2008. Come on, Sara. On the Waverider, Rory is locked up in the brig. The team demands an explanation from Snart, but Rip is prepared to use this opportunity to reform Mick. Funny enough, Snart is the only one convinced it can’t work. The others were all saved by him at one point or another in their journey, and Sara has to believe someone can overcome the shackles of a shadowy organization. Afterward, Rip hooks up Snart to Gideon and regenerates him a new hand, further confirming that no stakes exist on this series at all. Ray and Kendra meet up and profess their love for each other, and frankly she’s just jazzed to get to pick who she loves for the first time in thousands of years. The team regroups on the bridge and Rip sets a course for 2147, their last shot to hit Vandal Savage. 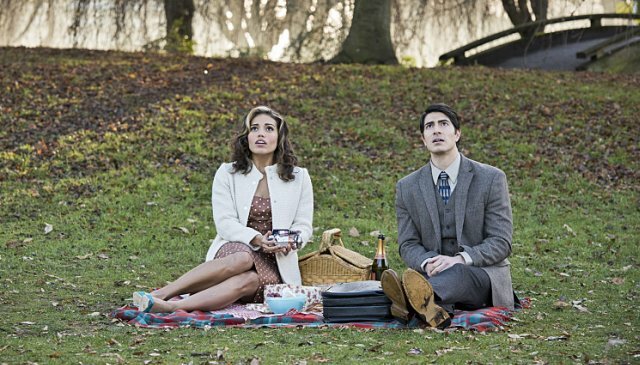 Just a regular reminder that DC’s Legends of Tomorrow has been renewed for a second season. You can watch a preview for next week’s episode, titled “Progeny,” using the player below.